Irises are sentimental because they were my maternal grandmother's favorite flower. Every time I see some I want to buy them. 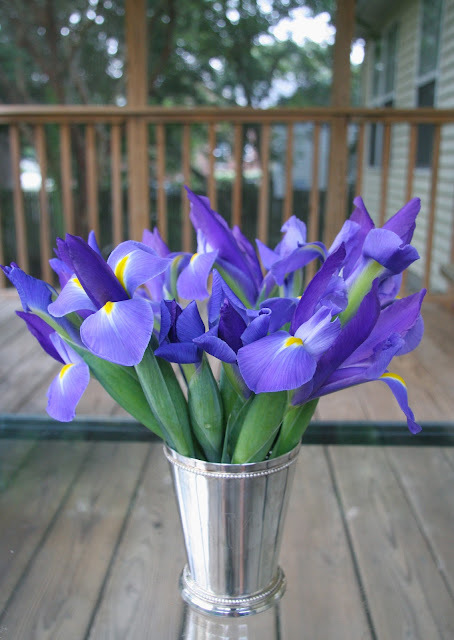 The irises are so delicate and open up perfectly. Don't the flowers remind you of the Brit's with their fascinators? This morning I put them in a little julep cup that was given to us for our wedding. Did you know that toothpaste helps to polish silver? I did it this morning and it worked wonders. Do you have any secret cleaning tricks?